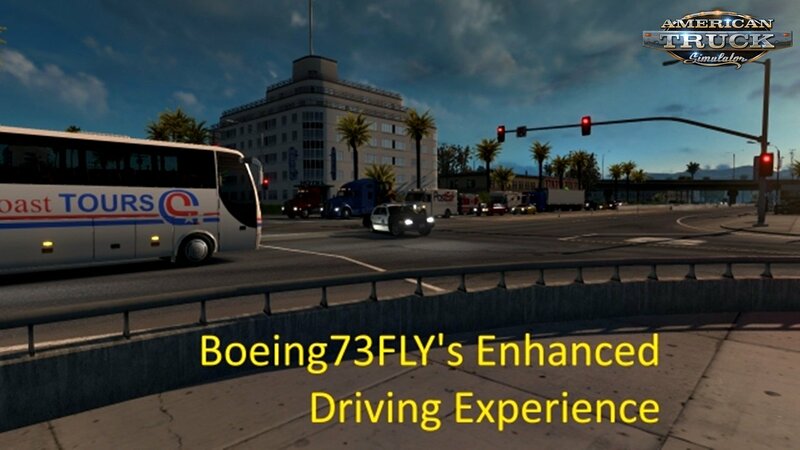 Mod Enhanced Driving Experience (EDXP) v1.12 by Boeing73FLY (1.34.x) for ATS | American Truck Simulator game. the in-game experience a little more "realistic". It contains several modifications to definitions and sounds. It is essentially the same mod package as published in Euro Truck Simulator 2, but specifically for American Truck Simulator. - Fixed traffic lights in some intersections in California. - Added sound to Amtrak ("trakus") locomotive. - Ford S-Max and Mercedes C-Class Estate are removed as they are not found in the United States. - All AI cars, trucks, and buses have realistic engine torque and top speed. - For every car, engine torque has been carefully researched. Each car will accelerate differently. - Top speed for every car varies according to their tire specifications based on research from the Tire Rack website. - Top speed varies for all trucks (65/72/78 MPH). - Top speed for all buses is 75 MPH. - Top speed for trams in San Francisco is 9 MPH. - In traffic, there are more variety of trailers (empty and loaded). - Traffic signals have longer and realistic timings. - Green light interval is at least 20 seconds. - Left-turn interval is 10 seconds. - Amber (yellow) light interval is 4 seconds. - Left-turn interval is 3 seconds. - 2-second delay interval between signals. - Car, truck, and train sounds are emitted based on brand and engine specifications. - Example: If you see a Tesla, you'll hear a hint of electricity powering it. - Buses utilize a specific diesel sound. - Tire noises have been added to all AI vehicles. sound the horn, unless you intentionally stop your truck in the middle of the road. - Rainfall is slightly louder, noticeable during heavy precipitation. - Feel Thor's power through your speakers with better thunder sounds! - When it is snowing, all you can hear is the sound of air (wind). - Sounds have been added to various movers such as flags, commercial airliners, and even the F-22 Raptor. tone emits for 0.5 seconds instead of the original 0.375 seconds. This mod must be installed at a higher priority over other sound or AI mods. Bugs *Please note that some of the following cannot be fixed by myself. - AI traffic: Some intersections in New Mexico may not turn left even though the light is green.